Aksharadhool: Pass the hat around! In some international organizations like Rotary, there is a tradition of passing around a hat, to collect contributions from members, for a worthy cause during weekly meetings. A hat would be passed around and each and every member present, is supposed to put in his contribution according to his own wish. It never works in that way. Everything depends upon the money put in by the first member. If he does put in a large amount, everyone else is forced to contribute with at least equal amounts or more according to his social status, because of the peer pressure. A more effective version of this technique is an announcement of the first contribution by the chairman of the meeting. Others simply have no choice but to follow him at least or preferably surpass him with their contributions. What is true for Rotary, also seems to hold true for the group of wealthy nations of the world. If a nation claims to be a super power, it also needs to behave like one. 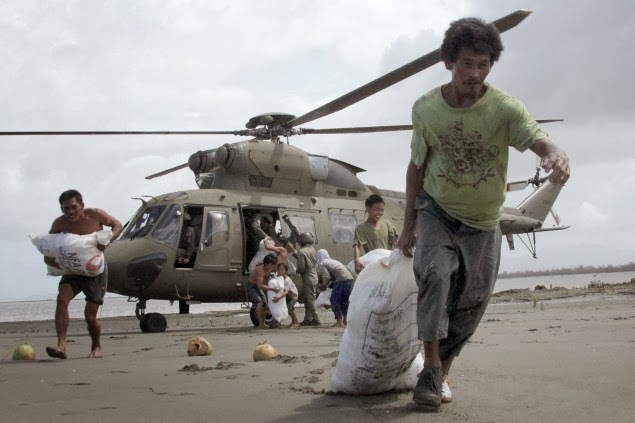 That appears to be the lesson for China from the latest controversy about its aid to Philippines, which was hit by one of the most disastrous typhoon 'Haiyan,' in first week of November 2013. 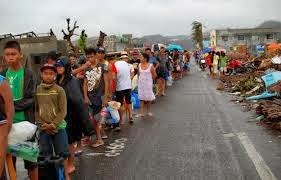 The super storm hit Leyte and Samar provinces in the Philippines with sustained winds with speeds exceeding 250 kilometres an hour and gusts of over 300kph. What followed and caused the worst damage was a 5-metre high storm surge, which swept away the port-city of Tacloban like a tsunami wave. 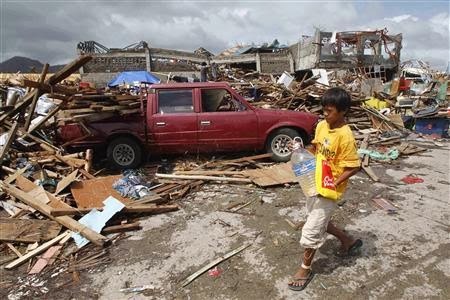 The official death toll stands at more than 2,300 victims drowned and some 11Million Filipinos have been affected. The international aid started trickling in slowly. Asian Development bank topped the list with $500 Million in emergency loans and $23 Million in grants. 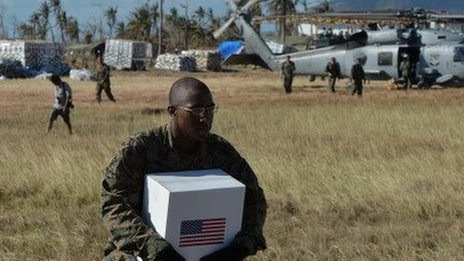 UK gave in all $50 Million and sent some ships to help US announced $20m in humanitarian aid, 300 military personnel, aircraft carrier and other ships, military aircraft plus logistics support.. Australia gave A$30m ($28m, £17m) package, including aircraft, medical staff, shelter materials, water containers and hygiene kits. European commission announced a package of $11 Million. UAE and Japan announced aid packages $10 Million. Even countries like South Korea announced aid packages of $5 Million. Indonesia offered logistical aid including aircraft, food, generators and medicine. But where was China? It first announced a measly grant of $100,000 followed by another $100,000 from the Chinese Red Cross. There was immediate criticism in western media. The Reuters news agency called it "relatively paltry"; Time Magazine described it as "measly" and "insulting". A TV anchor in US, called the Chinese as "stingy jerks." Stung by the criticism, Chinese announced a new aid package of $1.6Million. Even this amount remains still dwarfed by contributions by other nations. Surprisingly, even the Swedish furniture giant, Ikea, pledged $2.7Million. China had donated earlier, in sharp contrast to its donation to Philippines, over $10m for Japan in the wake of its tsunami two years ago and almost $40m for countries affected by the 2004 Asian tsunami. A question arises therefore that why is China reluctant to give aid to Philippines. One answer to that question could be that countries are locked in a territorial dispute over islands in the South China Sea, which has worsened over the past year. Chinese foreign ministry came up with a weak defence saying that China, too, was a victim of Typhoon Haiyan. But the figures of damage, 10 dead and an estimated $734m of damage, speak for themselves. State-run China Daily was more specific, saying: "Those China bashers must harbour ill intentions, aimed at either tarnishing China's image in the world arena or sowing further seeds of discord between China and the Philippines - as if the territorial dispute was not enough." International political observers all feel that the damage by this incident to China's international reputation is significant. Super powers are not expected to behave like that. They should be able to differentiate between politics and charity. Respect too has a Price !